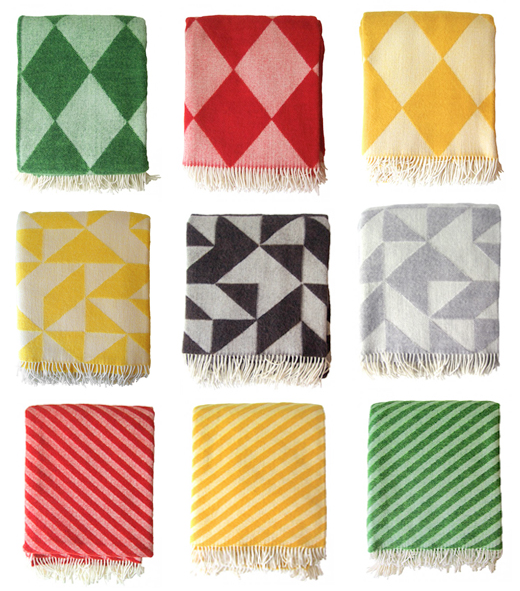 I think one of these harlequin blankets by Tina Ratzer is going on my wish list. (But which colour?) Made from 100% Scandinavian Merino wool, these adorable little softees are available through Fine Little Day out of Sweden. Click here for more info. oh they look so soft and nice... i want! I would need one in every colour. How great would it be to have a stack of these in your livingroom for chilly winter nights? Harlequin is so tempting! Love it. Yellow of course. Merino sounds soo soft. Thanks for sharing! What is it with sweden that I find very simple, clean awesome designs from there wherever I look...must be the water...those blankets look very soft and squishy, something my daughter would love. Those crazy Swedes and their fab design sense! Love the blankets. And even though it's meant to be ALMOST summer, the cool west coast weather is reminding me that I DO need a new throw.